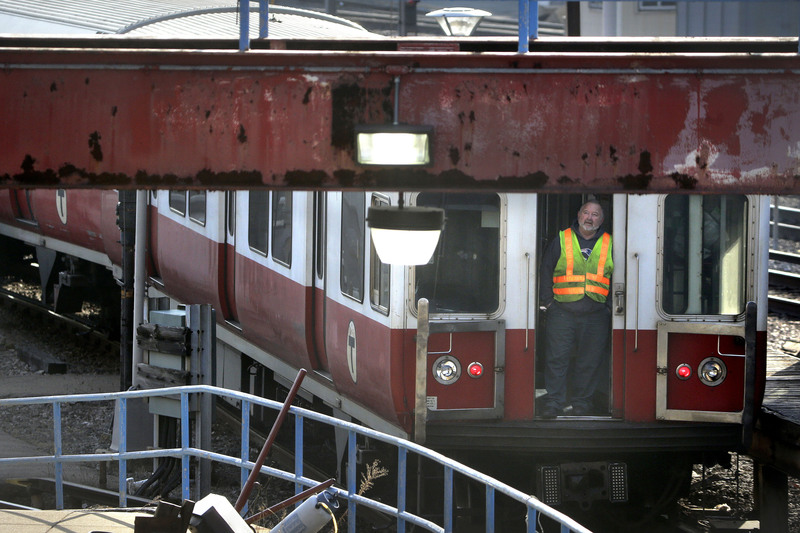 Boston - A six-car train carrying about 50 passengers left a suburban Boston transit station without a driver Thursday and went through four stations without stopping, and investigators were focusing on “operator error” as the reason why. The trip began shortly after 6 a.m. at the Braintree station and ended about nine minutes later when power was cut to the rails, transportation officials said. No passengers were hurt. Stephanie Pollack, the state’s transportation secretary, said the investigation was focusing on the Massachusetts Bay Transportation Authority train’s operator, who had sought and received permission to move the train despite a signal problem. The operator, a 51-year-old man with more than 25 years of experience with the MBTA, got off the train to execute a procedure to put the train into “bypass mode.” The ongoing probe, Pollack said, was focusing on whether the operator failed to properly secure the braking system before exiting the train. The employee suffered a minor injury when he was brushed by the train as it moved away from the station, transit officials said. The incident was an “unacceptable breech of our responsibility to keep our riders safe,” Pollack said at a late afternoon news conference. Gov. Charlie Baker said earlier in the day that it appeared the runaway train had been tampered with, although he also noted investigators had not determined whether the tampering was due to negligence or something else, and called it an “isolated” incident. The above-ground Red Line train departed Braintree Station — the southernmost stop of the line — sand traveled north toward Boston. MBTA operations employees disabled the train and brought it to a stop by gradually cutting off power to the electrified third rail. Before doing so, they had to quickly clear other trains from the tracks to prevent a collision. The train traveled at a maximum of 25 mph before being brought to a halt, Pollack said. Fernanda Daly, who was aboard, said nothing seemed unusual about the ride until the train started to slow down and the interior lights went out. “The people who were on the first car were trying to knock on the door of the conductor and that’s when we discovered that there was nobody there,” said Daly. Some passengers tried to open doors or break windows to get off the train after it stopped, she added. Transit personnel boarded the train after it was stopped and drove it to the JFK/UMass stop, where passengers disembarked. Transit officials initially contacted the FBI and the state police, but later determined that their assistance would not be needed. The Federal Transit Administration was assisting with the probe, and Pollack said the National Transportation Safety Board had been contacted but had not yet decided whether to investigate. All time great story. Into the Hall of Fame immediately!